Mycorrhizal with Aspen. Found on the ground in the forest. 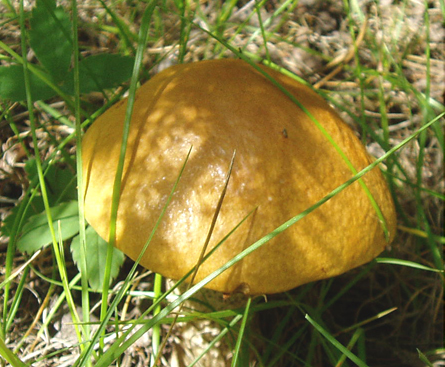 The Rocky Mountain Poison Center received occasional reports of serious gastric problems, some requiring hospitalization, from eating moderate amounts of so-called orange caps, usually well cooked, found under aspen in various part of Colorado. There is believed to be a certain type of Leccinum that is getting people sick in Colorado. Eat at your own risk. I personally know people who eat them without any ill effects. Poisoning may be due to older specimens. It is unfortunate too since the are a very abundant mushroom. Very easily confused with Boletus Edulis, however Boletus Edulis does not stain grey / black when cut, and does not have dark scales on the stem. Also, Boletus Edulis is typically found under conifers in Colorado while L. Insigne is found under Aspen. Other Leccinum's however grow under conifers, stain different at some stages and are more reddish color.